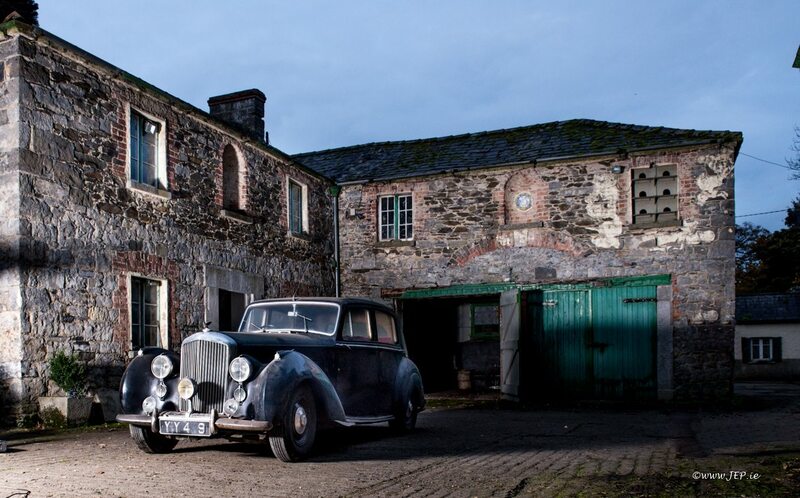 SWVA are delighted to offer for auction on 27th January a recently discovered Bentley MK VI which had been gathering dust in the same motor house on a Irish country estate where it has been residing since 1951. This car is an incredible find – a time capsule 1949 Bentley MK VI that displays a highly credible 46,000 miles and is in remarkable condition. Grace was to use the car sparingly on high days and holy days clocking up only 46,000 miles. Remaining single, she was a keen horse woman who bred a Phoenix Park winner. The car was a familiar sight at the Royal Dublin Society horse shows as well as at racecourses around the country. Grace was Grand Dame of the Order of Malta, a lay religious charity and used the car in that capacity too. A period photo on file shows her in the car flying the Order’s pennant on the radiator. The history file contains interesting documents amongst them customs carnets enabling passage between Northern Ireland and the Republic in the pre-Troubles years. These carnets recorded the make of tyres and radio fitted to the car following inspection at the frontier check points presumably to eradicate the smuggling of such items. By 1976 it would no longer have been advisable to drive a car with a UK registration in the border regions of the Republic so the car was reregistered with the current Co Louth number. Miss Carroll appears to have ceased using the car on the road in 1984 as that is the year of the last tax disc on the windscreen. Grace passed away in 1999 and the estate and car were inherited by her cousin. By his own admission he is not interested in vintage cars though he did keep the car exercised by driving around the estate from time to time whilst keeping it in the same dry motor house where it has nestled comfortably for the last 65 years. Today the car presents exactly as parked up in 1984, a time capsule oozing patina and character! The entire car is in fundamentally solid and sound condition in every respect and with all fittings and fixtures present. The doors close with a pleasing click and have good shuts. The engine fires up on the button and runs as sweet as a nut. A short drive demonstrates that all gears are selecting without issue there is a good clutch. The seats had tailored covers fitted in 1981 however a cursory examination shows the leather underneath to be soft and free from splits albeit they are in grubby condition with the colour lifting. The wood is good throughout. The semaphores are in working order and there are no aftermarket indicators fitted. A quick drop window lever is fitted to the driver’s door. The sliding roof is opening and closing. The small tool tray under the dash still contains most of its contents. The factory radio crackles into life once the valves have warmed up and is still tuned to Radio 4. So untouched is the car, the ashtrays still contain lipstick stained cigarette butts – of the family’s variety naturally. The owner’s manual is in the glove box along with Royal Irish Automobile handbooks going back to 1956. The speedometer reads 46,000 miles, a figure backed up in writing in a letter which also details some of the history of the car. As well as the aforementioned items the history file contains an old duplicate Irish buff logbook as well as copy of the Bentley factory records along with an old invoice. This car is being offered without reserve and presents an excellent and probably unrepeatable opportunity to acquire a fascinating car that is a restorers dream!